You will zoom across the bay at high speeds, taking in all the scenery and with the possibility of taking the controls yourself, with the instructor keeping watch. This is definitely a fun, action packed activity with guaranteed smiles. 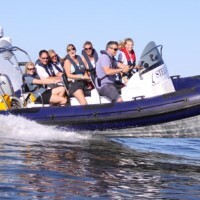 A Speedboat Ride/Rib Ride is a fantastic activity for any group looking for adventure, fun & the ultimate in high speeds and adrenalin. You will zoom across the bay at high speeds, taking in all the scenery and with the possibility of taking the controls yourself, with the instructor keeping watch. This is definitely a fun, action packed activity with guaranteed laughter & screams for the whole group. The instructor will ensure you all have a great time hopefully out in the blue skies with the sun shining, but if not, then the choppy sea and a bit of rain will actually add to the excitement of the trip. After your high speed fun, take to 1 of the waterside restaurants on offer for a spot of lunch or 2 course evening meal and a few drinks.